Steampunk and Gothic Goggles and Eyewear consist of goggles and monacles in every form imaginable! 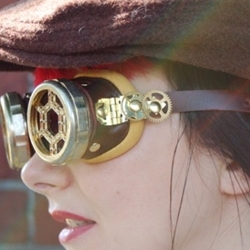 These Cybersteam Goggles are a great affordable pair of steampunk eyewear. This wonderful eyewear has soft rubber around each eye cup and an adjustable elastic strap for easy fit. This imposing monocle will give a distinguished look to just about any airship pirate. This wonderful eyepiece has soft rubber around the eye cup and an adjustable elastic strap for easy fit. Fantasy or Sci-Fi? Steampunk or Mad Max? No matter your costuming choice, this industrial looking Monovision Monocle is a great accessory to add to a variety of unique costumes. This wonderful magnification device is perfect for your investigations. Made of antiqued brass with a leather wrapped wooden handle and real glass with a 2X magnification. A great steampunk accessory for your Holmesian adventures. Also available with small screen. This wonderful magnification device is perfect for your investigations. Made of antiqued brass with a leather wrapped wooden handle and real glass with a 2X magnification. A great steampunk accessory for your Holmesian adventures. Also available with Large screen. Believed to be the first optical device to successfully filter polarized light waves (however, the striated glass element has sadly been lost). Richly made in steampunk style, this Steampunk Monocle is a clever accent.. This Victorian Magificator is a great magnifying piece for your desk or travel bag. This rich Victorian magnificator has a large 4X lens mounted in an ornate antique bronze fitting. A faux horn handle and matching finial complete this beautiful piece. These winged goggles are a great pair of unique eye wear suitable for many outfits! Made of plastic with an antique gold finish and brown suede-like wings. The intricate wing details give these goggles a metallic look.